The 'GG' Grimsargh Green floral display pictured this sumer, created by members of the Friends of Grimsargh Green. The Friends of Grimsargh Green (FOGG) have continued to improve the village green, but are appealing for more people to help. 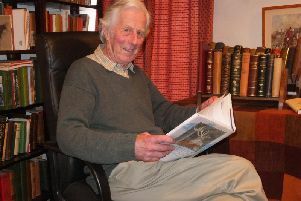 “FoGG is now a group of only three people and we are always looking for volunteers to join us to help us with our work and if anybody would like any information about our work or wishes to come to help, they will be very welcome,” says volunteer Peter Croft, who can be contacted on petercroft45@gmail.com. He says the group started the year with a tree planting scheme at the Whittingham Lane end of the green in conjunction with Preston Council. They planted a variety of 20 semi-mature trees in two groups which it is hoped will enhance the green for years to come. FoGG members have also turned their thoughts to the willow structures which were in need of serious attention, two volunteers agreeing to virtually rebuild them. This started in spring and it is hoped it will be completed over forthcoming months. It was also decided to replace four rotten benches with re-cycled plastic ones, Peter saying they were lucky to receive a grant of £1,000 from the Lancashire Environmental Fund, and in late spring the sedum in the raised ‘GG’ bed was targeted as it had not been too successful. The sedum was removed, some of it being relocated to cover the ‘bug hotel’ near the pond and this is now said to be growing well and looks an attractive addition. They then chose to do some summer bedding in the’ bed with begonias which, Peter says, have looked “spectacular and extremely colourful” during the summer. Other schemes being planned include tree and shrub planting with 5,000 purple crocus bulbs donated by Rotary to promote Polio awareness called “Purple4Polio” being planted by pupils of St Michael’s and Alston Lane primary schools. “They should look spectacular when they flower,” added Peter.